It’s impossible to look at one of Philips’ TVs over the past few years without noticing the eye-catching Ambilight technology. For the unaware, Ambilight is a system where a series of RGB LEDs placed on the rear of the TV are used to illuminate the wall behind. The thinking goes that the images displayed on your TV’s screen are only half the quality battle (well, the majority, but hear us out). What’s also important is the ambient light surrounding your TV. Some might put a lamp behind their TVs to try and create a similar effect to reduce eye strain – all Ambilight is doing is building that into the set itself. But Philips hasn’t just been focussing on putting a pretty light show behind your TV, it’s also making sure the images on the set itself are just as impressive. Two years ago Philips debuted its new P5 Perfect Picture Processing engine in its high-end sets, and the big news in 2019 is that the engine is coming to more TVs throughout the range. Philips announced that the P5 would come to 23 sets in total, meaning all of these TVs will benefit from the five-pronged picture processing technology that includes enhancements to contrast, colour, sharpness, source quality and motion. Every set from the 7 Series and above now features the P5 chip. We’ve been impressed with the effects that the P5 has been able to create in the past, and no doubt the fact that it’s coming to more sets is nothing but a good thing for fans of Philips’ televisions. Beyond the P5 chip coming to more sets, Philips didn’t make any sweeping claims about picture quality having improved over 2017’s models. As mentioned above, Ambilight still features on a large portion of the sets released this year. Certain, more budget-focussed, models (from the lower 6503 downwards) across the range will not be equipped with the rear-positioned LEDs if you’d rather not bring the lightshow into your home. Of course, as with previous Philips sets, it’s possible to disable Ambilight on the TVs that are equipped with it. All the ranges from the 8 Series up will support HDR10, HDR10+ and HLG, but Dolby Vision continues to be absent from Philips’ sets. Increasingly, it looks like your next TV purchase is going to involve you picking a side between the two, despite what Dolby is claiming about the two standards co-existing. In terms of Smart OS, Android TV is the operating system of choice for the more premium TVs, but as we move down the ranges this switches to Philips’ own-brand Saphi OS, while the low-end TVs dispense with Smart TV functionality entirely. We’ll detail exactly which OS is supported by each TV further down. In terms of naming convention, each of the LCD TV’s names are made up of its screen-size, the letters ‘PUS’ and then the four digit series number. For example, the 49-inch version of the 8503 will be called the Philips 49PUS8503. Meanwhile the OLEDs use the letters ‘OLED’ rather than ‘PUS’. Philips OLED 973 (65-inch): Philips has followed LGs lead with its OLED range, as the primary point of differentiation between them is their sound solution. The 973 (previously announced at IFA 2017 as the 9 Series / 9603) has the best sound of the bunch with a chunky built-in soundbar that contains a whopping 8 drivers powered by a single 60W amp. Like the LG W7 this soundbar also receives all the TV’s inputs, and hence can’t be detached. Philips OLED 803 (55- or 65-inch): The new announcement for 2018 is the 803 (full model name Philips 65OLED803), which has a strikingly minimalist design with just a pair of thin sticks acting as its stand. Sound is handled by a trio of rear-mounted subwoofers, which should provide more heft at the lower end of the sound spectrum. 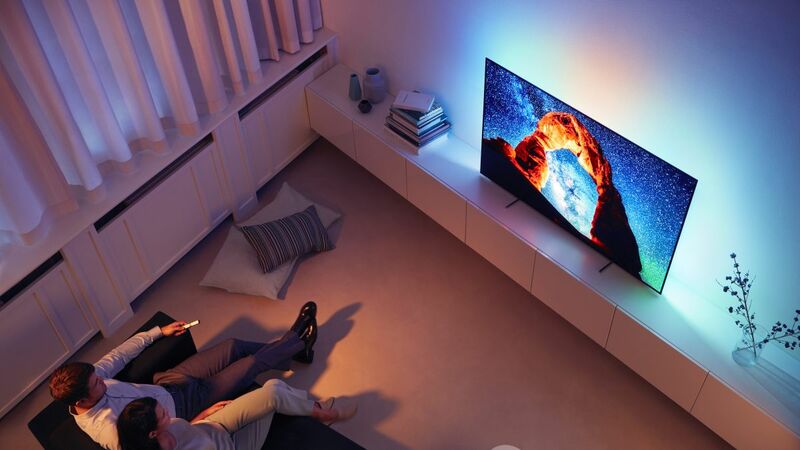 Philips OLED 873 (55- or 65-inch): The 873 is, broadly speaking, the same set that we reviewed in 2017 when it was released as the Philips 9002. The new development here is a larger 65-inch model (the Philips 65OLED873) which is unlikely to change too much about the TV other than its size. Philips 8 Series: The 8 Series so far consists of two models, the 8503 and the 8303. The 8503 will be available in sizes ranging from 49 to 65-inch, while the 8303 has a much broader 43- to 75-inch spread. Both feature a Nano ELED panel with a maximum brightness of 400 nits, although they do support both the HDR10 and HLG HDR standards. At the core of each set is Philips’ P5 picture processing engine, which continues down the lineup. From the information we’ve received it appears that the difference between the two is in the speakers, with the 8503 having the slightly beefier setup. Philips 7 Series: Within the 7 Series there are two main groups of TVs. There’s the 7503 (which can be had at either 49- or 55-inch), and the 7803 (which ranges from 43- to 75-inch models). These two sets feature edge lit panels rather than the Nano ELED of the 8 series, but peak light output is still 400 nits. Further down the range the 7303 (available from 43- to 65-inch), drops the peak light output to 350 nits and features a Direct LED backlight. From this point on, the range loses HDR10+ support. If you want compatibility with the new HDR standard you’ll have to pick from the 8 Series and above. Philips 6 Series: The main thing you’re giving up when you drop into the 6 Series are the P5 picture processing engine and Android TV. Instead, these TVs are equipped with the last generation Pixel Precise Ultra HD chip, which offers less picture processing power than the current-gen P5, and Philips’ own-brand Saphi OS. There are just two ranges within the 6 Series, the 6503 (available from 43- to 65-inch) and the 6703 (45- to 65-inch). The 6503 loses the Ambilight technology found in every other TV above it in the range. Philips 5 Series: Hop down into the 5 Series and resolution drops down to Full HD, you lose HDR, picture processing is handled by the even older Pixel Plus HD engine, and there are no Smart TV capabilities on anything other than the 5803. Light output is even lower at 250 nits (although without HDR the benefits of a brighter panel would be slim), and there’s no Ambilight to speak of. Depending on the exact range, these TVs get mighty small. The 5303 is either 22- or 24-inch in size, the 5403 is only 22-inch, the 5503 is slightly bigger at 43- or 50-inch, the 5603 is 24- or 32-inch, the 5703 is just 22-inch, and the 5803 (the only set in the range to feature a smart TV functionality) is available between 32- and 50-inch. Philips 4 Series: Down at the bottom of the range is the lowly 4 Series. There’s just one range here, the HD Ready 4503, and it’s only available in a 32-inch size. However, aside from resolution the 4503 is similar in functionality to the 5 Series. Dead by Daylight Fog Whisperers – Who’s in the Pilot? Facebook “10 Year Challenge” meme: Could it mine your data for facial recognition?